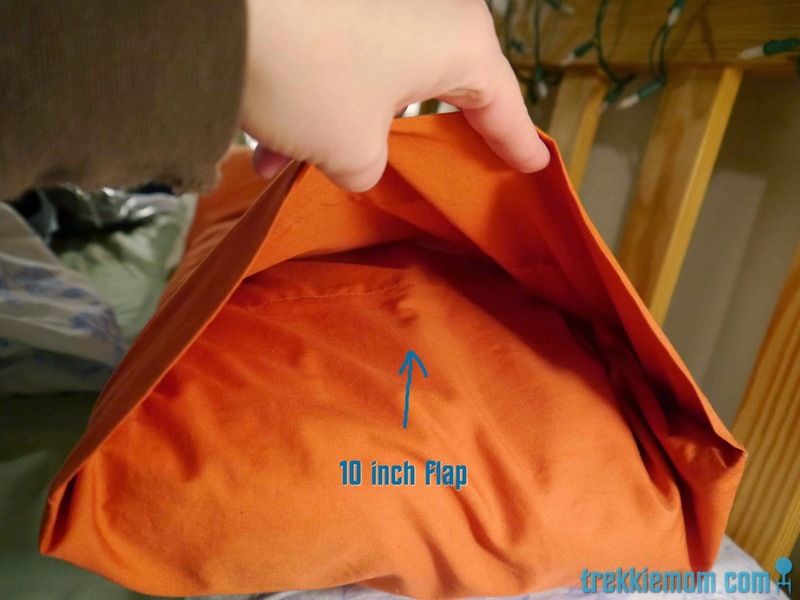 Firstly, measure your pillow or an existing pillowcase, since this tutorial could be used for any pillowcase. If you choose to buy a flat sheet, keep in mind this tutorial is using one flat sheet to get 4 panels = 2 body pillow covers, ie. 19" x 4 = 76, etc. 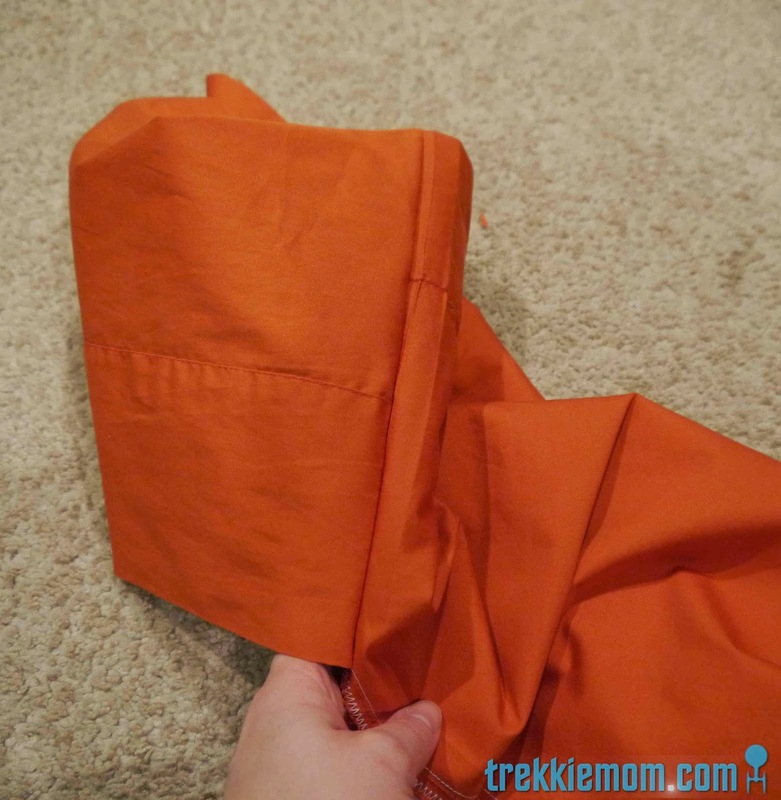 Dimension on my burnt orange Walmart twin flat sheet. Then decide where you want to purchase your bed sheet. Both of my bed sheets for both the green and the burnt orange body pillow came from Walmart. Pre-wash with whatever water temp you would use for the rest of your bedding. I know lots can be said bad and good about Walmart, but I have found their basic color sheets to be nice and comfortable after washing. They also stand up to rigorous use. 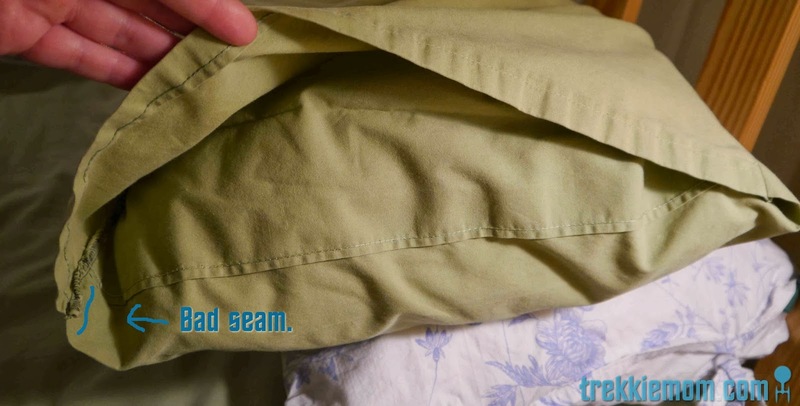 I have had several fitted sheets from them for several years and likely hundreds of washes, and I have yet to see a pill or tear appear. So, sheet is already cut in half, what should I do? Luckily, our body pillows are a bit old and squished, so I figured, I could still stuff the pillow inside even if it wasn't 19 inches wide, but I was looking at less than 16" if I didn't pull the seams on either side lengthwise. 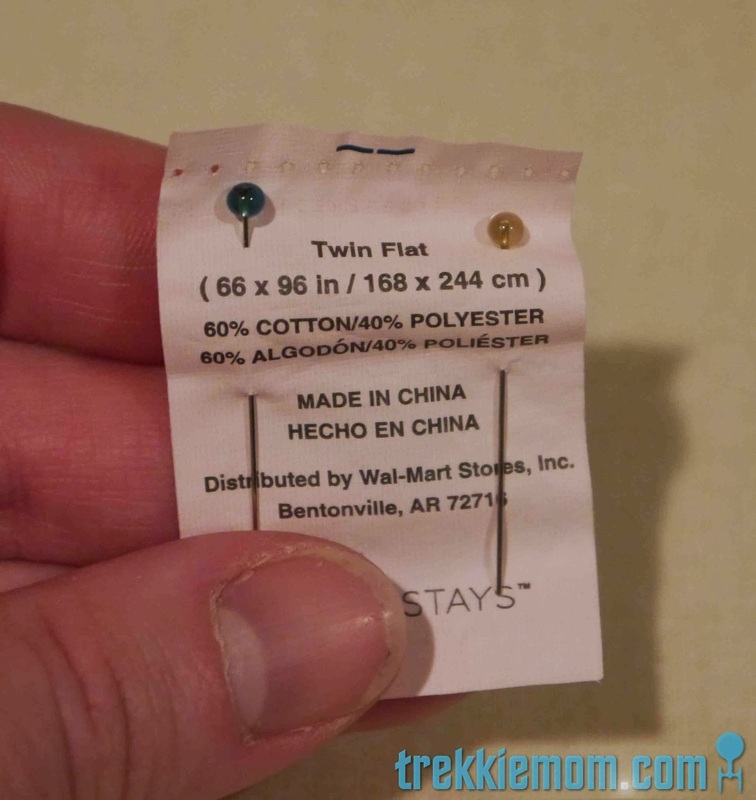 I took the time15-20 minutes getting friendly with my seam ripper to gain that precious material. Leave the width-wise seams intact as they will save work in the long run. 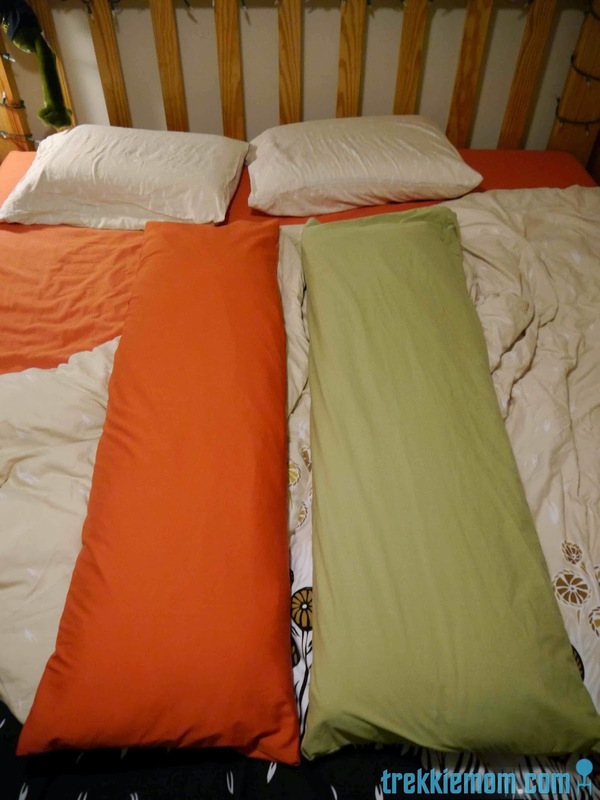 If your sheet is wider than you need, you will have to trim down to 19 inches or whatever it is that fits your pillow. Even with the extra inch and a half of fabric, I wasn't sure it would fit, but I decided to give it a go anyway, so I cut my 2 halves into half. Now, there are 4 panels that are 16.5 inches wide but still need some trimming lengthwise. 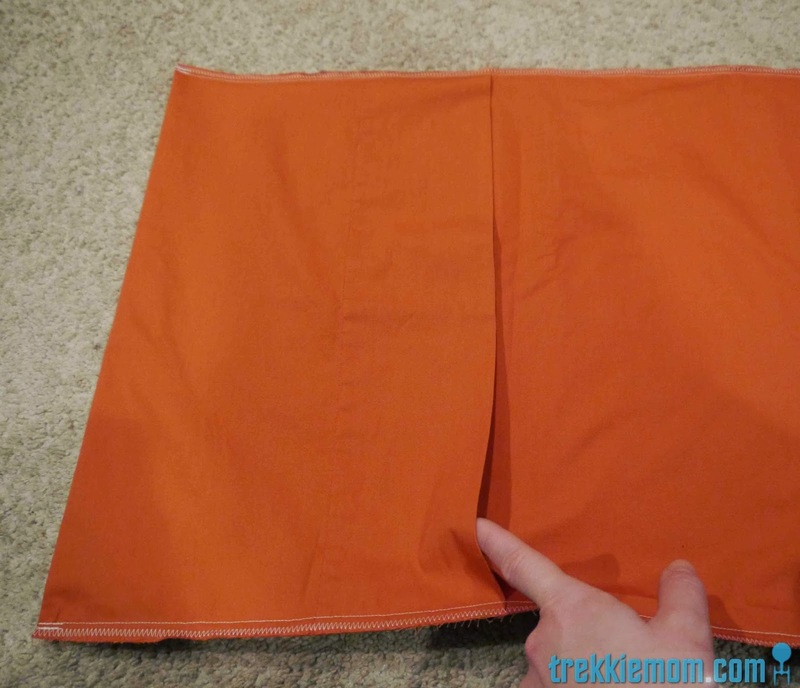 Choose what seam you like, the thin one at the bottom of the sheet or the wide one at the top or one of each. 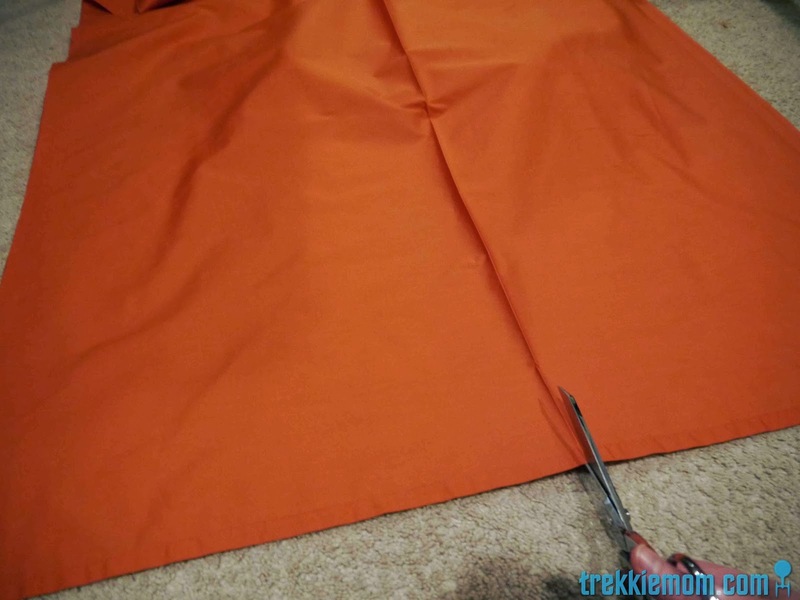 Cut one panel 51 inches long or the length of your pillow. You will see the seam you left of this one, since you left it intact. 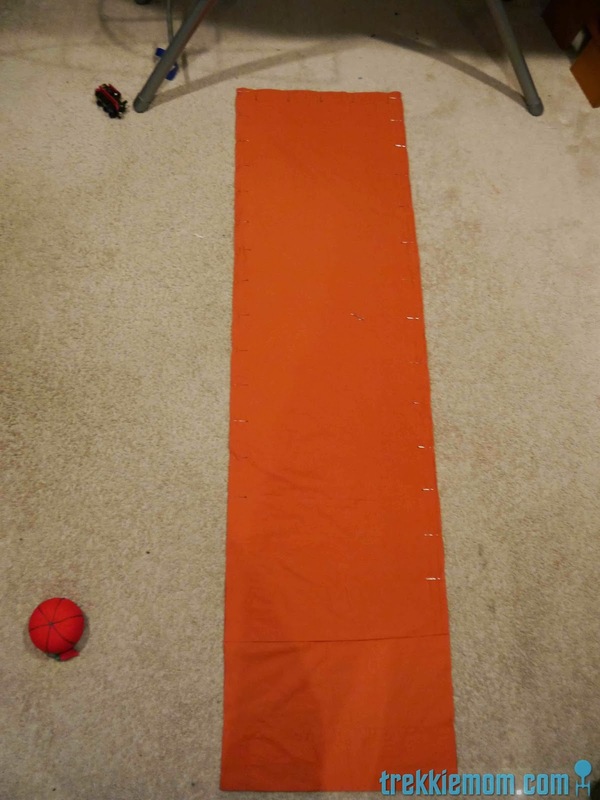 Cut the other panel 61 inches long (or thereabouts, basically add 10 inches to length for your second panel). 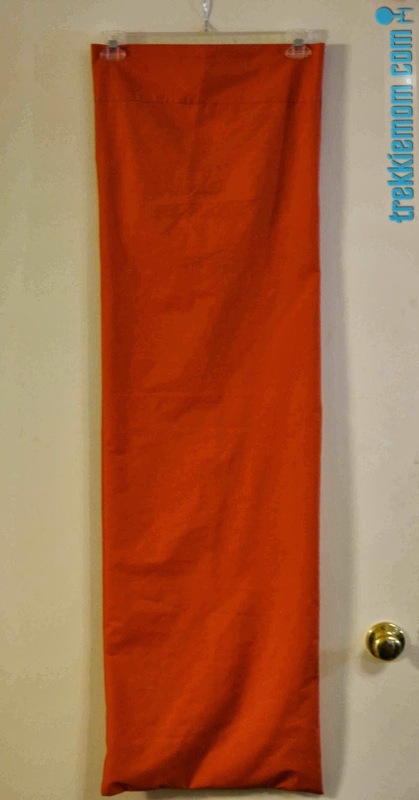 The extra length is for the inner flap. 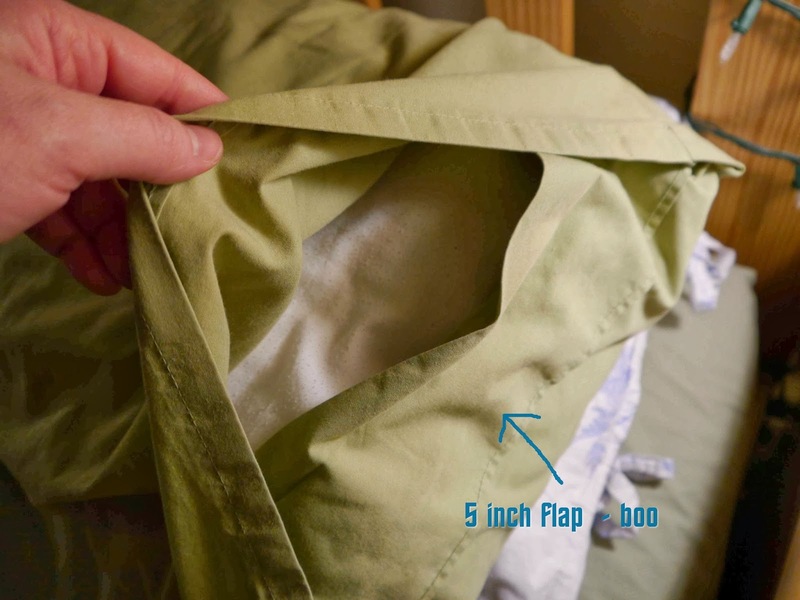 If you are creating a flap for a smaller firmer pillow, 10 inches for the flap is likely too much. You can take off a couple of inches or maybe even half. Here is the reason why I am making my flap 10 inches long. Green Cover - first attempt at flap with 5 inch flap. I mean, really, what is with the pooch. It doesn't even really keep the pillow inside! It reminds me of shopping for jeans with the pooch in the back that makes me feel like my body type is abnormal. Put wrong facing sides together, and start pinning from the freshly cut raw edges at the bottom. 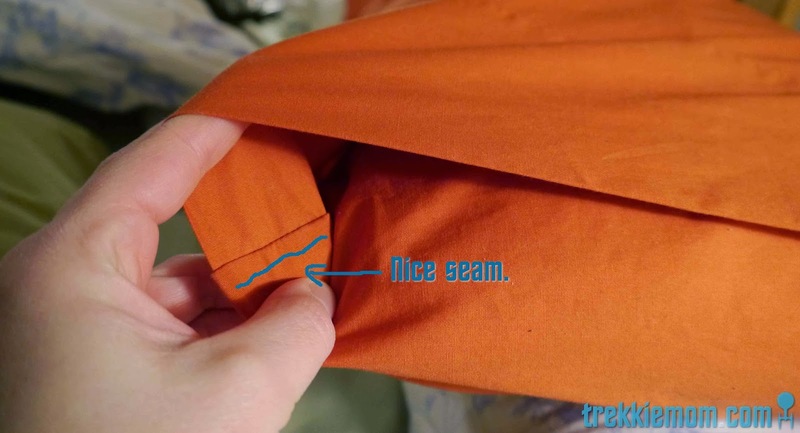 Notice, if you have not cut off or undone the top or bottom seams, you are using them for the opening of your pillow. Time saved. 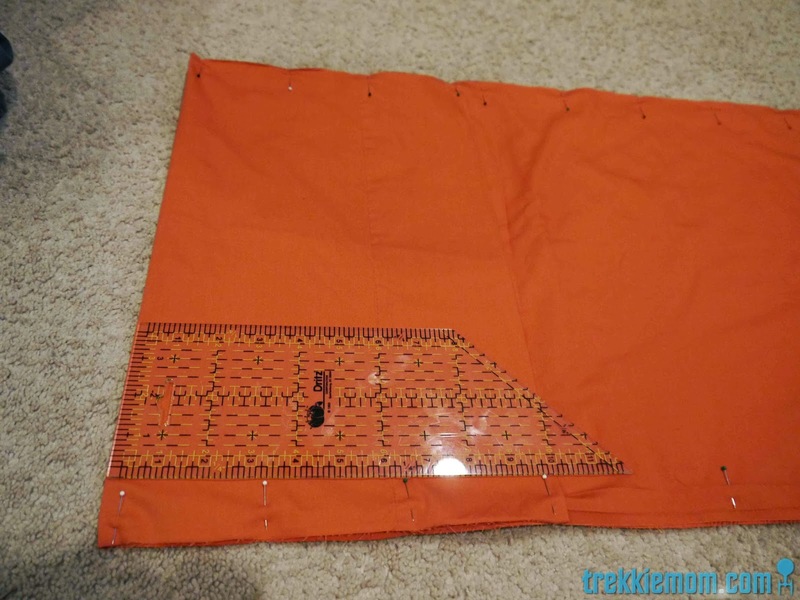 When you near the top, fold the extra flap on top of the opening as closely as you can to the finished edge of the other panel without folding that panel down, and pin the sides. For some of you this may seem weird, like you are closing off the end, but trust me. It works. I did it the other way before and the finish was not as nice. The green was the 'other way'. Bad. Ugly seam visible to all. Yuck. Now it is time to sew. 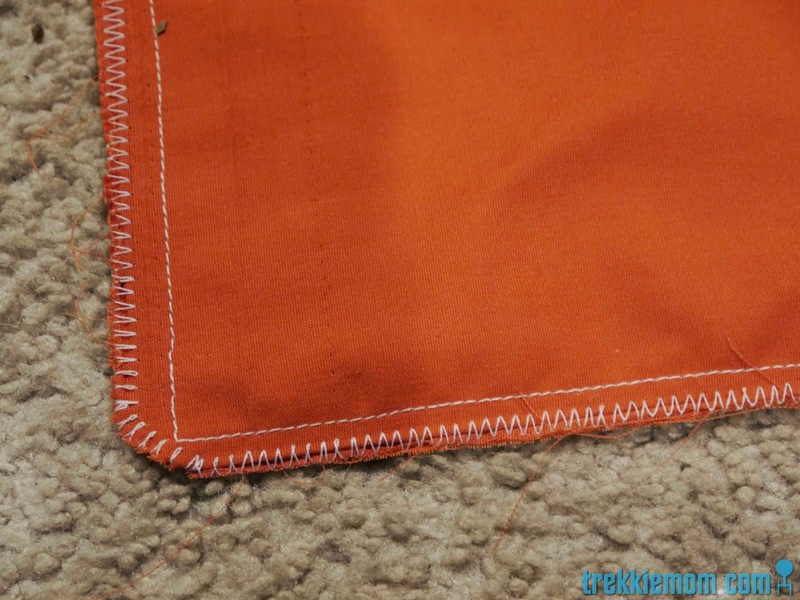 Sew a straight stitch on 3 sides, excluding the pillowcase opening. I used a .25 inch seam allowance since my panels were so skinny already. It wasn't a bad choice. I would recommend it anyway, to prevent the seams from being too bulky. Next, clip the corners a bit to remove bulk, and serge or zigzag the raw edges to prevent fraying. Look at the beautiful seam on this pillowcase. I told you it would look good. Oh, yeah. Looks store bought. Perfection. Nirvana. Whatever you want to call it, I love it. Now put it on your body pillow. Voila, matching fitted sheet (which I also bought at Walmart) and body pillow cover. I think the thinner one looks better than the one that is of actual width, but that is likely because my body pillows are old and more maleable. 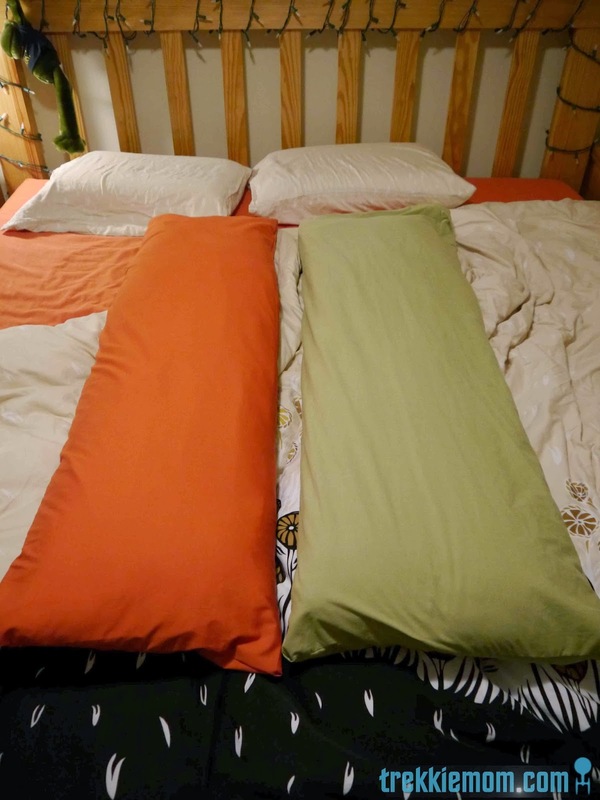 I hope you enjoyed my easy body Pillow Cover Tutorial from a Bed Sheet. Thanks so much! I shared my success on my blog's facebook page.